‘Padhna bhi hai aur kamana bhi hai’ ‘ I have to study as well as work’ says 21 year old Dhiraj Kumar. He belongs from a very poor family and resides in a village called Barh. After numerous repeated requests he got the assistance of Rs 8000/ from his village youth association (Ambedkar Yuva Manch) of BDVS. He invested that money and started a small vegetable shop. This help changed my life my hope started fulfilling, says the happy youth. He earns Rs-400/ to Rs-500/ a day. 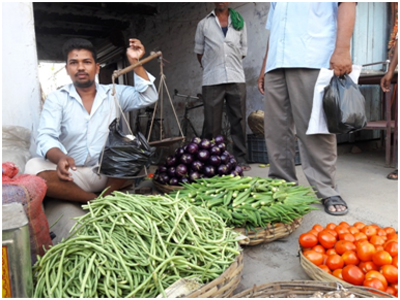 His mother sells vegetable in the morning hours because at the same time he goes to ITI classes. He sells vegetables in the afternoon to evening. With the money earned, he meets the needs of his family, pays for the studies of his and his sister’s ‘children ‘Behan ka bachcha ka zimedari ke sath sath sab chiz acha se chal raha hai’. I am very much grateful to the youth association for helping me to change my living and the future of my family said Dhiraj.